For those of you who are not quite familiar with the concept of magnetic reconnection, it is a physical process in highly conducting plasmas in which the magnetic topology is rearranged and magnetic energy is converted into kinetic energy. Two factors, the whistler-mode waves and electron temperature anisotropy, play a key role both prior and during the magnetic reconnection. Yet, what is the relationship between whistler-mode waves and the so-called “reconnection”? How the magnetic reconnection in the magnetic tail is triggered? Answers to above questions elude worldwide space science scientists for quite a long time. 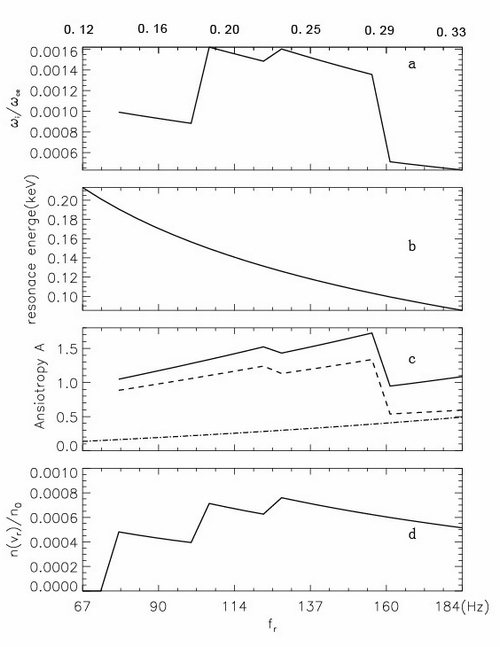 Recently, based on the Cluster spacecrafts observations, WEI Xinhua from State Key Lab of Space Weather, National Space Science Center (NSSC), etc, revealed the generation mechanism of the whistler-mode waves in the plasma sheet prior to magnetic reconnection. Theoretic analysis shows that the electrons with positive temperature anisotropy can excite the whistler-mode waves via cyclotron resonances. Using the data of particles and magnetic field, the international research group consisted of Chinese, Czech, France, and UK scientists, estimated the whistler-mode wave growth rate and the ratio of whistler-mode growth rate to wave frequency. They are 0.0016fce (Electron cyclotron frequency) and 0.0086fce, respectively. Therefore, the whistler-mode waves can grow quickly in the current sheet. The combined observations of energetic electron beams and waves show that after the southward turning of magnetic field, energetic electrons in the reconnection process are accelerated by the whistler-mode waves. 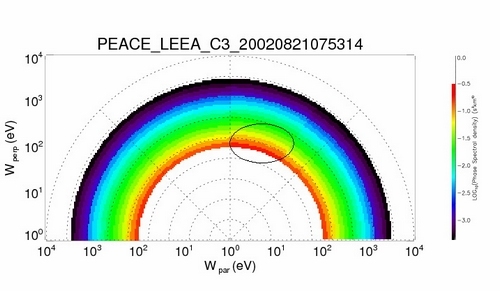 "The whistler-mode wave activities observed by satellites in the current sheet prior to the onset of reconnection reveals the status of plasma sheet prior to magnetic reconnection and will shed light on the vital question of how magnetic reconnection is triggered,” said WEI Xinhua, young space scientist at State Key Lab of Space Weather, NSSC. The article entitled Generation mechanism of the whistler-mode waves in the plasma sheet prior to magnetic reconnection was published on a COSPAR Punlication, Advances in Space Research, with support from National Natural Science Foundation of China (NSFC) and the Specialized Research Fund for State Key Laboratories of China.